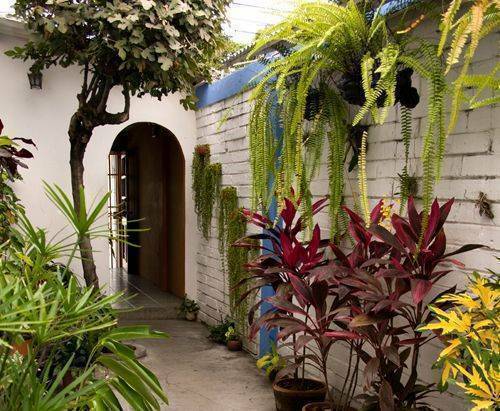 TANGARA is a home with comfortable rooms, plants and artwork around the place; an oasis-like experience in the middle of bustling Guayaquil. 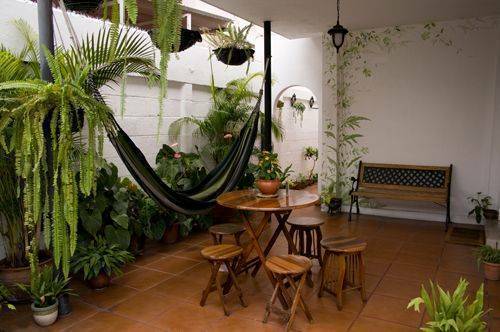 Safe, friendly and relaxed atmosphere; Tangara is located in a house of the sixties, in a residential neighborhood of northern Guayaquil. 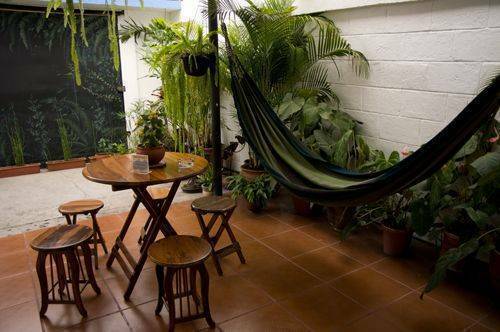 Rather than staying in a hotel, you will feel at home and close to the local life. A school, a church and the main university in the city are our closest neighbours, followed by the Malecón del Salado waterfront.. 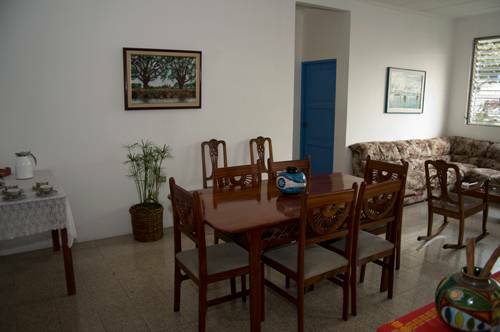 Guests share a living room and the dining room and have free access to the kitchen and a pleasant garden, which offers the chance of watching many local plants and bird species. Being close to the airport, we should also expect, eventually, the noise of planes over the neighborhood. The staff dining room, Labodega, is also available for our guests to have lunch. Complimentary breakfast is served between 07h45 and 10h30, unlimited internet and WiFi area, local and national telephone calls and airport pick up upon arrival in Guayaquil (for specific instructions, please send us an email with flight information). Free travel advice by the in-house travel agency that offers mainly communitary and nature tours to the ecuadorian Amazonia, andean highlands, Galapagos islands and the coastline. All our standard rooms have private bathroom, hot water shower, national direct dial telephone, air conditioning and cable TV. 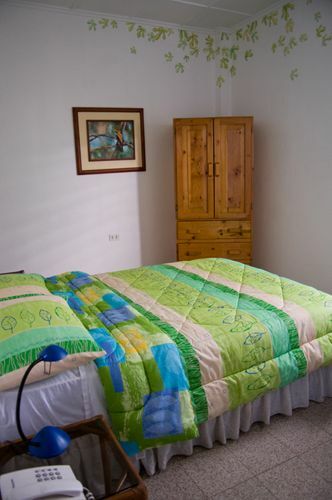 Double room has one double bed, twin room has one double and one single bed or two twins; triple room has one double and one single bed. 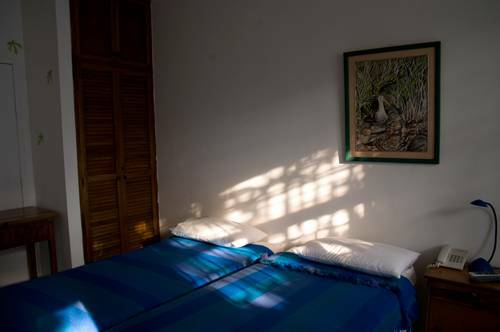 The guest house is located between the airport, northern residential neighborhoods and downtown; close to the Malecòn del Salado (one of the two main waterfronts in the city, a promenade area alongside one of the mangrove canals that surround Guayaquil), from where you can reach 9 de Octubre (the main avenue in downtown), which you can follow to the other waterfront, the Malecón Simon Bolivar (10 minutes by taxi or 30 minutes walking). Balance due on arrival should be paid in cash (sorry, not credit card or traveler checks) and 12% tax should be added. aIRPROT PICK UP IS AVAILABLE FOR AN ADITIONAL CHARGE OF usD 10, 00 (DAYTIME) AND usd 20 IN THE NIGHT (19H00-07H00); for that purpose you should email us details of your point of origin, airline, flight number, and estimated time of arrival in Guayaquil. If you requested an airport pick up; please look for someone with a sign with your name written, once you leave the luggage clearance area in Guayaquil airport. If for some reason you will do it on your own, you can take a taxi from the airport, most drivers will know where the guest house is. From the bus terminal many drivers may not know wherewe are, in which case you should tell them first to go to Ciudadela Bolivariana (name of the neighborhood) which is located close to the University of Guayaquil. Once in the neighborhood, they should look for Manuela Sàenz street (Paralell to Delta avenue, where the university is), which is behind the main entrance of the church, and then for the corner of O`Leary street, where you will find a concrete wall with a white fence and a small sign with our name. Sân bay gần nhất: José Joaquín de Olmedo, 6 kms.